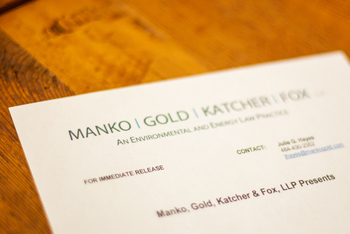 The environmental, energy and land use law and litigation firm of Manko, Gold, Katcher & Fox (MGKF) is a Gold Sponsor of the Tri-State Shale Gas Business Summit taking place on Thursday, May 30 from 8 to 11:30 a.m. at the National Constitution Center in Philadelphia. This program was conceived by the PENJERDEL Council and is co-hosted by the Marcellus Shale Coalition (MSC). Bruce S. Katcher, one of the founding partners of MGKF, is chair of the PENJERDEL Council Environment and Energy Committee and has worked closely with PENJERDEL Executive Director Andrew Warren and the program panelists to put together a unique program.